Though Peach Valley is desert—and deserted—a close look reveals early spring flowers. These little purple flowers are tiny! The agenda yesterday (Friday) was more exploration of Peach Valley. I’ll put the GPS track in a separate post because it’s a little complex and bears its own explanation. The area I explored is just to the north of the Peach Valley and Chukar Road area I looked through on Saturday, April 10th (see this post for details). Peach Valley Road travels north and south. Several roads lead east that climb up to the Gunnison Canyon rim to various trailheads. The rim is the boundary of the Gunnison Gorge Wilderness, meaning no mechanized travel allowed. I traveled up two of these roads: Duncan and Bobcat. Duncan Trailhead is to the north of Bobcat. The road offers a pretty spectacular view back to the west, plus a teaser of a view down into the Gunnison Gorge, which is what you see here behind the sign. The Red Rocks Nighthorse Trail is a motorcycle singletrack that runs north and south along the rim. I tried following for awhile but quickly decided I was too pooped to go very far given the steepness, the rocks, and the scree. While I was at Duncan Trailhead I popped the $15 for a BLM wilderness permit good for one year. That way, should I want to leave the bike and hike a little, the government and I are square. South of Duncan Trailhead is Bobcat Trailhead. The last bit of road was pretty rough, so hikers parked back down the hill. I made it up with no problem. I’ll admit I fell in love with this place. The views were spectacular, not to mention a handy picnic table and shelter. I sat on the canyon’s edge for quite awhile before moving on. Although an overcast day, the view is still plenty spectacular. That's Grand Mesa in the background. Even the rocks themselves show color! This closeup shows various colors of lichen. These rocks are the very top point of the ridge. The ground to the west, back along the road, is steep enough, but to the east the slope is precipitous. 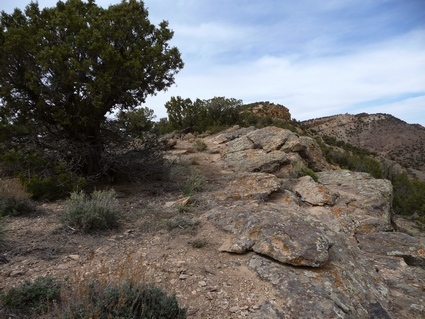 To the south, the Red Rocks Nighthorse Trail is a 4WD road, meaning a Jeep could try it. I went up a little ways on the motorcycle, but again met steep terrain with many loose rocks. No fun! Plus by this point I was pretty tired out, so turned around and went back to Peach Valley Road and home. This entry was posted in Montrose County, Motorcycling. Bookmark the permalink.